Just to let you all know after a long and grueling ride by our very own Maurice and his brothers in arms completed their Charity Bike Ride. 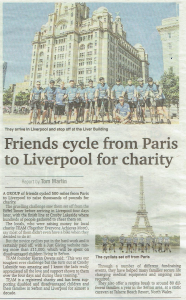 We are delighted to say that every single one of them made it back safe and sound following the 502 mile ride from Paris back to Crosby Lakeside, Liverpool. We just want to let everyone know that not only was the target figure reached but it was surpassed, everyone involved has raised a staggering £11,503.00 so far. Which will go towards helping disabled children within the Sefton area purchase equipment. Here at A1 Lifts we are very proud of what Maurice and the rest of T.E.A.M Sefton achieved. We would like to thank all our friends, family, work colleagues and everyone who donated towards this great cause. If you would still like to donate you can, just click on the link below to do so.